Wall mounting is certainly the most elegant and optimum installation option as to building physics. 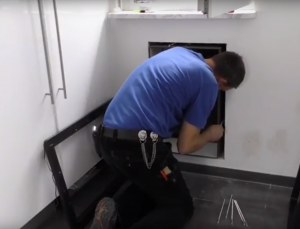 The video shows the installation of a petWALK door size Large into a wooden wall over a period of four hours by the company Vet-Concept. After preparing the opening as shown in the video, the petWALK door is mounted. We recommend working in a pair of two: While one person does the vacuuming, the other one sweeps ;) Then, cut the tunnel set as well as the threaded rods to the appropriate lenghts and fit the outer frame of the petwalk door alongside the tunnel into the opening. The inner frame is connected to the outer frame through a cable and eight threaded rods. After sealing the door and tunnel waterproof, the petWALK door can be turned on.